Directed by Grigori Chukhari and written by Chukhari and Valentin Yezhkov, Ballad of a Soldier is the story of a soldier who is granted a leave to visit his mother as he gets a closer look at the devastation of war in his home. The film is a drama set during a war where a young man tries to find hope in the chaos of war as he would also fall in love with a young woman. Starring Vladimir Ivashov, Zhanna Prokhorenko, Antonina Maksimova, Nikolai Kryuchkov, and Yevgeni Urbansky. Ballad of a Soldier is a heartfelt and visceral film from Grigori Chukhari. Set in World War II, the film follows a young soldier whose heroism has granted him a two-day leave to visit his mother as he goes on a journey via train where he is later accompanied by a young woman eager to visit her wounded fiancé. It’s a film with a simple story as it plays into a man getting a look at the chaos of what is going on outside of the battlefield as ordinary people struggle to survive during the time of war. The film’s screenplay explores this young soldier in Private Aloysha Skvortsov (Vladimir Ivashov who would take down two tanks with a gun as his general (Nikolai Kryuchkov) is impressed and gives him a two-day leave to see his mother and fix her leaking roof as he has to return to the battlefield. During this journey that would take nearly two days, he would encounter various characters such as a wounded soldier returning home as he’s convinced his marriage is over and later this young woman named Shura (Zhanna Prokhorenko) who would stow away on the same train he’s boarding as she is eager to see her fiancé. The two would befriend each other as they go on a few stops including one to deliver a present for the wife of a fellow comrade as it play into many realities of what happens in war. At the same time, they try to do what they can to help others in the terror of war as well as raise morale. Grigori Chukhari’s direction is definitely mesmerizing in terms of the dazzling compositions he creates from the opening sequence of Pvt. Skvortsov in the battlefield to the scenes on the train. Filled with some unique wide shots to capture the vastness of the locations as well as some entrancing close-ups and medium shots to get a look into the characters. Chukhari would create images that do have this very enchanting look but also play into something that is intimate such as the scenes of Pvt. Skvortsov on a train compartment with hay as he sees Shura for the first time sneaking onboard. There are moments with the tracking dolly-shots that are quite entrancing in the way Pvt. Skvortsov and Shura see rural parts of the Soviet Union as well as these camera angles that play into the duo helping people out as well as hear the news about the war. It’s also got some dreamy images as it relates to the journey that Pvt. Skvortsov is taking as it’s all about seeing his mother no matter how little time he has to return to the battlefield. Even as it is about the role he is playing for the world as it’s a role that would be of massive importance for those he’s fighting for. Overall, Chukhari creates an evocative yet ravishing film about a young soldier’s journey home to see his mother. Cinematographers Vladimir Nikolayev and Era Savelyeva do brilliant work with the film’s black-and-white cinematography from the usage of sunlight for some of the interior/exterior scenes as well as the usage of lighting for some of the close-ups and scenes at night. Editor Mariya Timofeyeva does amazing work with the editing with the stylish usage of dissolves for a dream sequence as well as some rhythmic cutting to play into the drama. Production designer Boris Nemechek does fantastic work with the look of the hay bale train compartment as well as the hospital and the home of one of the soldier’s wives. Costume designer Lyudmila Ryashentseva does nice work with the costumes as it is mostly straightforward to play into that period of the times. The sound work of Venyamin Kirshenbaum is excellent for the eerie atmosphere of what is going on in the cities and rural areas including a scene late in the film involving bombs. The film’s music by Mikhail Ziv is superb for its soaring orchestral score that play into the drama as well as the sense of longing that Pvt. Skvortsov has for his mother as well as Shura later in the film. The film’s marvelous cast include some notable small roles from Valentina Telegina as an old woman truck driver, Gennadi Yukhtin as a fellow private in Pavlov, that Pvt. Skvortsov meets on his way home and gives him a present for his wife, Georgi Yumatov as a sergeant giving soldiers some soap, Vladimir Pokrovsky as Pavlov’s ill father, V. Markova as Pavlov’s wife, Marina Kremnyova as a neighbor of Pvt. Skvortsov from his home village, Aleksandr Kuznetsov as a soldier guarding the train, Yevgeni Teterin as a lieutenant inspecting the train, Yevgeni Urbansky as a wounded soldier, Elza Lezhdey as the wounded soldier’s wife, Nikolai Kryuchkov as Pvt. Skvortsov’s general who is impressed by the young private, and Antonina Maksimova in a wonderful small role as Pvt. Skvortsov’s mother who is waiting for her son’s return. Zhanna Prokhorenko is incredible as Shura as a young woman who stows away on a train as she joins Pvt. Skvortsov on his journey as she copes with her role in the world while falling for the young private. Finally, there’s Vladimir Ivashov in a remarkable performance as Pvt. Aloysha Skvortsov as a nineteen-year old soldier whose bravery in battle allows him a two-day furlough to visit his mother as he deals with the journey he takes as well as falling for a young woman who would help him observe everything he sees. 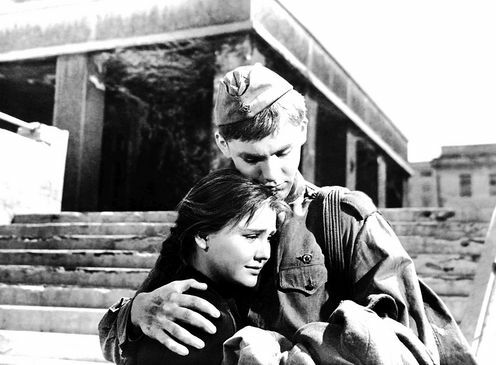 Ballad of a Soldier is a spectacular film from Grigori Chukhari that features sensational performances from Zhanna Prokhorenko and Vladimir Ivashov. It’s a war drama that manages to bend genres as it focuses on people outside of the battlefield seen from a soldier just eager to see his mother for what could be the last time. In the end, Ballad of a Soldier is a tremendous film from Grigori Chukhari. My experience with Russian film is severely limited. This one sounds interesting, though. I'll keep it in mind for a possible Blind Spot List, next year (there's no way I'll get to it before that). @Wendell-This is a great film and certainly essential of Soviet cinema but for me, the best introduction to Soviet cinema is the works of Andrei Tarkovsky. I'd either go for Solaris, Stalker, or The Mirror. They're not easy to watch due to their slow pacing but it is quite rewarding. I've been trying to find this one to watch since you wrote about it but having no luck. @assholeswatchingmovies.com-I think it's available on Filmstruck. I managed to record it when it was on Turner Classic Movies. That is the best channel to show these foreign classics.